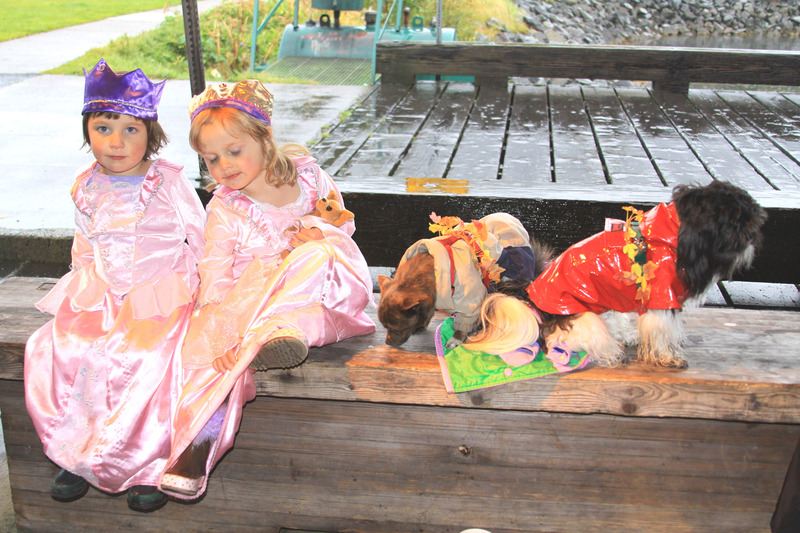 Despite high winds and rain, a large crowd of about 150-200 people showed up at Crescent Harbor Shelter on Saturday, Sept. 25, for the 16th annual Running of the Boots, a fundraiser for the Sitka Local Foods Network. The event was part of the third annual Summer’s End Celebration hosted by the Greater Sitka Chamber of Commerce and the Alaska Cruise Association. Jesuit Volunteer priests, fairy princesses, witches, swimmers and a bug. Some costumes were covered by heavy rain gear, but the XtraTuf rubber boot (aka, the Sitka Sneaker) was a key part of just about every costume. While there was a race on Saturday, the event was all about fun, with a lip-synch event and the Sitka Blues Band to spice things up. And we even had a table to sell late-season Sitka Farmers Market produce. 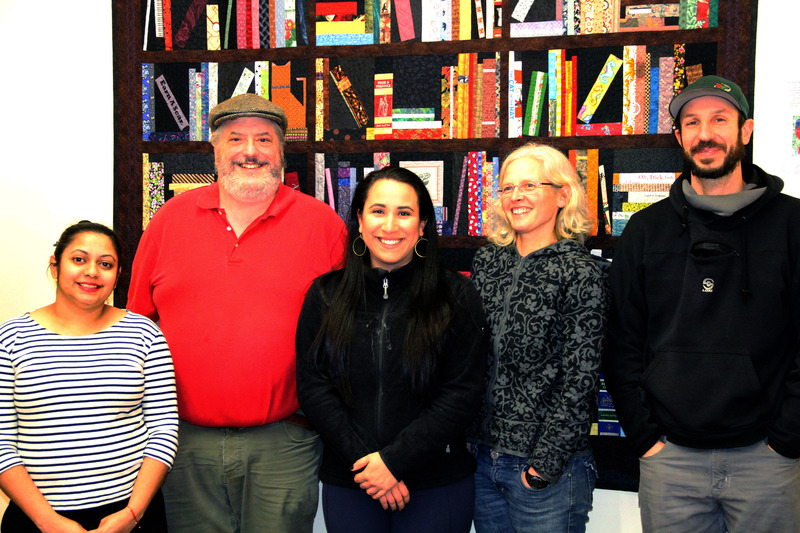 The Sitka Local Foods Network appreciates everybody who participated in this fundraiser. A slideshow from the Running of the Boots is posted below, and you can go to our Shutterfly site for a similar slideshow. Sitka Local Foods Network board members Maybelle Filler, left, and Suzan Brawnlyn, right, present home baker and honey/jelly maker Iris Klingler with the Table of the Day Award for the fifth Sitka Farmers Market of the summer on Sept. 11, 2010. 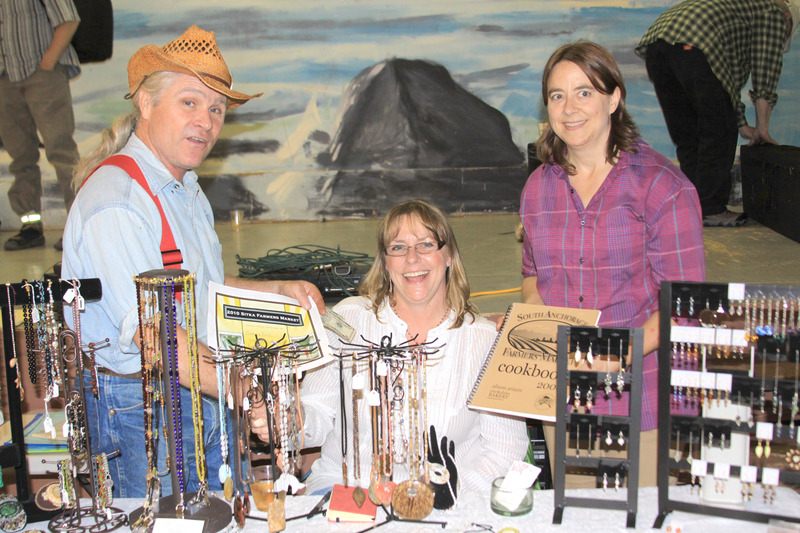 Iris Klingler won the Table of the Day award at the fifth and final Sitka Farmers Market of the summer on Saturday, Sept. 11, at Alaska Native Brotherhood Hall. 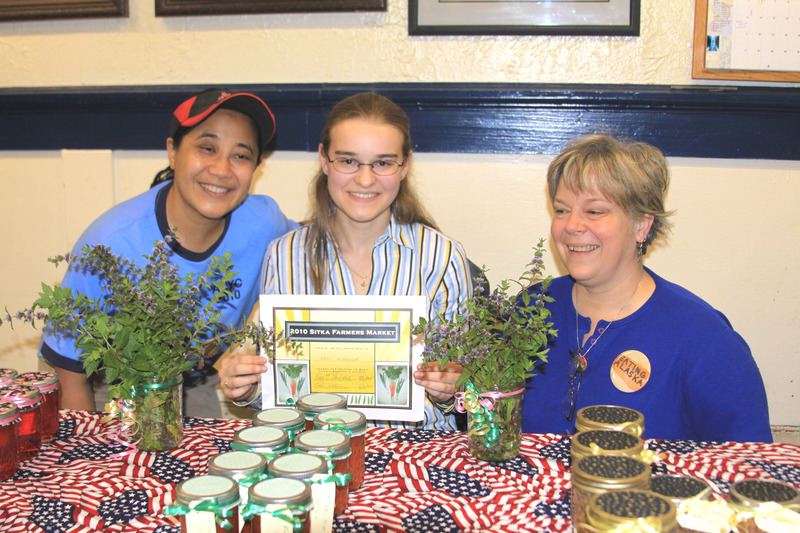 The local home baker and honey/jelly maker was presented with a certificate, $25 cash and a farmers market cookbook by Sitka Local Foods Network board members Maybelle Filler and Suzan Brawnlyn. Iris is one of the market’s newest vendors, but her table was a big hit. She sold out of her bread before the market was much more than an hour old, and her honey and jelly also sold well. One vendor at each of the five Sitka Farmers Markets this season received similar prizes as the Table of the Day. 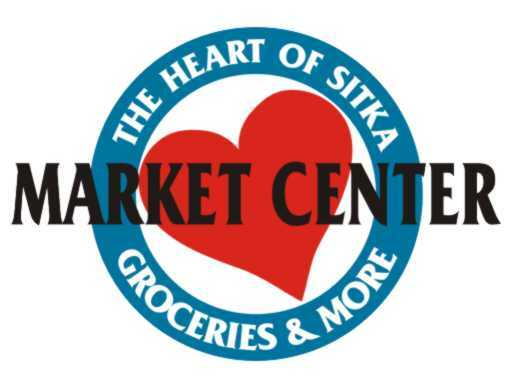 This was the last big market of the summer, so Sitka residents will have to wait for next summer for the next opportunity to buy locally grown produce, locally caught fish, locally baked bread and locally made crafts at the Sitka Farmers Market. 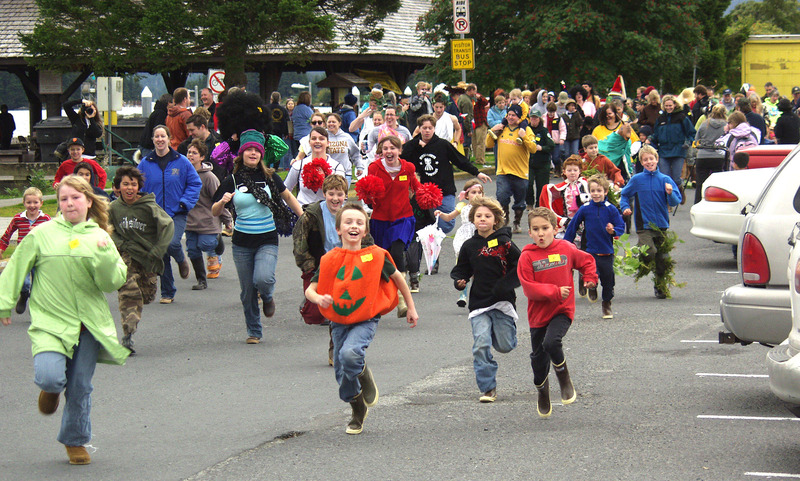 Runners hit the trail during the 14th Annual Running of the Boots race on Sept. 27, 2008, in Sitka. 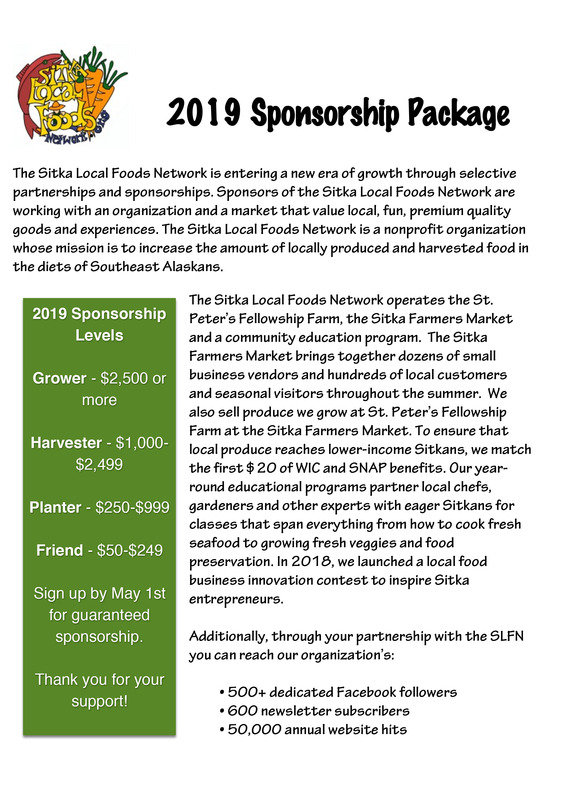 Local Foods Network takes place at 11 a.m. (registration opens at 10 a.m.) on Saturday, Sept. 25, as part of the third annual Summer’s End Celebration hosted by the Greater Sitka Chamber of Commerce and the Alaska Cruise Association. This fun run for people sporting XtraTufs rubber boots features a run from the Crescent Harbor shelter through downtown Sitka and around St. Michael’s Russian Orthodox Cathedral. 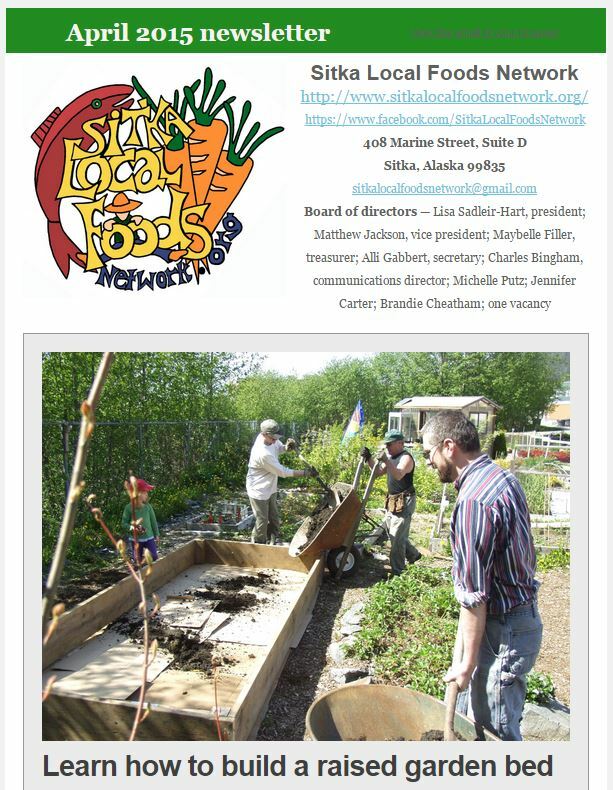 Since St. Peter’s Fellowship Farm and several other local gardeners have late produce, the Sitka Local Foods Network will have a table or two of produce for sale at the Running of the Boots, with all proceeds going to the non-profit Sitka Local Foods Network to help us with our various projects. The produce tables won’t be as big as a typical Sitka Farmers Market, but WIC clients will be able to use their farmers market produce coupons. More details on the Running of the Boots are posted elsewhere on this site. A slideshow of photos from the fifth Sitka Farmers Market is posted below, and a similar slideshow can be found on our Shutterfly site. Sitka Local Foods Network board members Linda Wilson, left, and Lynnda Strong, right, present home baker Bridget Kauffman with the Table of the Day Award for the fourth Sitka Farmers Market of the summer on Aug. 28, 2010. Bridget Kauffman won the Table of the Day award at the fourth Sitka Farmers Market of the summer on Saturday, Aug. 28, at Alaska Native Brotherhood Hall. The local home baker was presented with a certificate, $25 cash and a farmers market cookbook by Sitka Local Foods Network board secretary/treasurer Linda Wilson and board member Lynnda Strong. Bridget has been at every market this year, one of many new bakers who have signed up to be vendors at the markets. Bridget bakes a variety of breads, from whole wheat and rye to specialty breads with nuts, seeds and other flavors. She made 40 loaves to sell at the first market, and sold out of them before the first hour was over. She has doubled her production, and still sells out before the market ends. 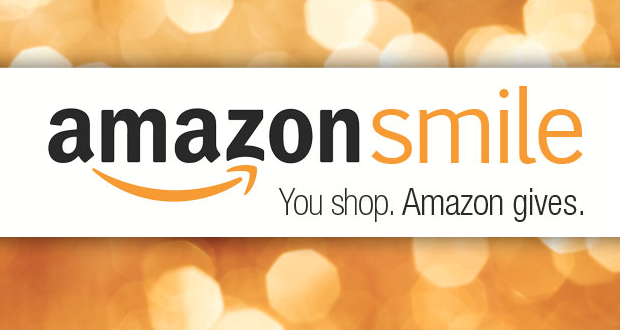 One vendor at each of the five scheduled Sitka Farmers Markets this season will receive a similar prize. The last big market of the summer is from 10 a.m. to 2 p.m. on Saturday, Sept. 11, at historic ANB Hall. We look forward to seeing you there. 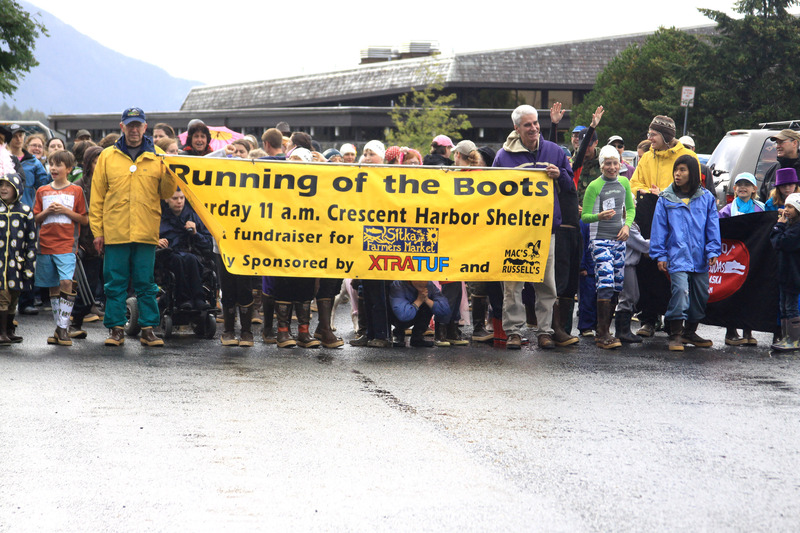 Also, don’t forget the 16th annual Running of the Boots fundraiser for the Sitka Local Foods Network takes place at 11 a.m. (registration opens at 10 a.m.) on Saturday, Sept. 25, as part of the third annual Summer’s End Celebration hosted by the Greater Sitka Chamber of Commerce and the Alaska Cruise Association. This fun run for people sporting XtraTufs rubber boots features a run from the Crescent Harbor shelter through downtown Sitka and around St. Michael’s Russian Orthodox Cathedral. There usually are one or two small tables with late produce, but not as many vendors as a regular market. More details on the Running of the Boots will be available later this month. A slideshow of photos from the fourth Sitka Farmers Market is posted below, and a similar slideshow can be found on our Shutterfly site. Sitka Local Foods Network board president Kerry MacLane, left, and secretary/treasurer Linda Wilson, right, present Sammee Falk of Sammee's Creations with the Table of the Day award at the third Sitka Farmers Market of the summer on Saturday, Aug. 14, at Alaska Native Brotherhood Hall in Sitka. Sammee Falk of Sammee’s Creations won the Table of the Day award at the third Sitka Farmers Market of the summer on Saturday, Aug. 14, at Alaska Native Brotherhood Hall. The local jewelry maker was presented with a certificate, $25 cash and a farmers market cookbook by Sitka Local Foods Network board president Kerry MacLane and board secretary/treasurer Linda Wilson. Sammee has been at every market for the last two years. She uses beads and a lot of found objects in her jewelry, such as broken glass found on the beach. One vendor at each of the five scheduled Sitka Farmers Markets this season will receive a similar prize. The next markets are from 10 a.m. to 2 p.m. on alternate Saturdays, Aug. 28 and Sept. 11, at historic ANB Hall. We look forward to seeing you at our next market. A slideshow of photos from the third Sitka Farmers Market is posted below, and a similar slideshow can be found on our Shutterfly site. By the way, if you haven’t already done so, please go to the America’s Favorite Farmers Markets contest site, run by the American Farmland Trust, and vote for the Sitka Farmers Market. Voting is broken down into four categories based on the number of vendors at each farmers market. The four categories are Boutique (15 or fewer vendors), Small (16-30 vendors), Medium (31-55 vendors) and Large (more than 56 vendors). 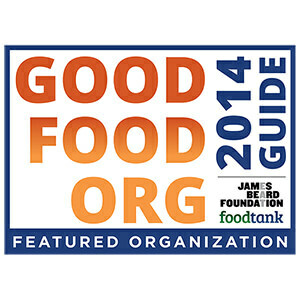 The Sitka Farmers Market competes in the Boutique category, and we need about 50 votes to climb into the national top-20 ranking for our category. Even though the Sitka Farmers Market is in the smallest size category, it was the leading vote-getter for Alaska as of Thursday, July 29. 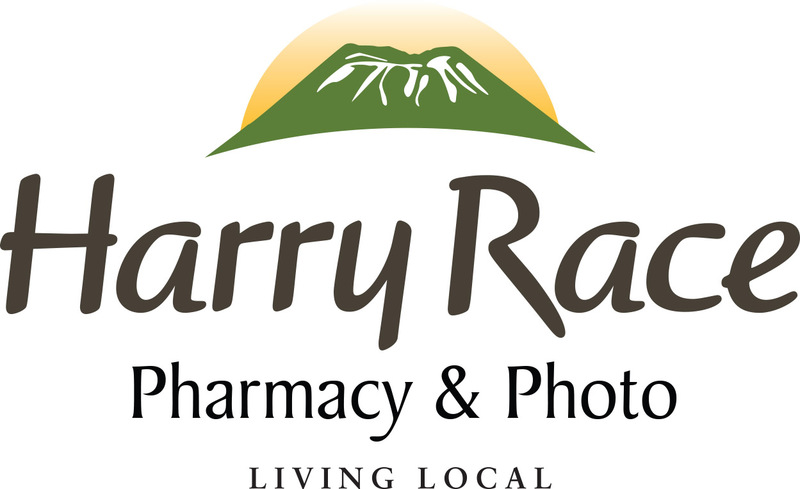 But a flurry of voting that night vaulted HomeGrown Market of Fairbanks (originally listed as a Medium market, but now listed as Boutique) well ahead of us in the battle for the top market in the state. 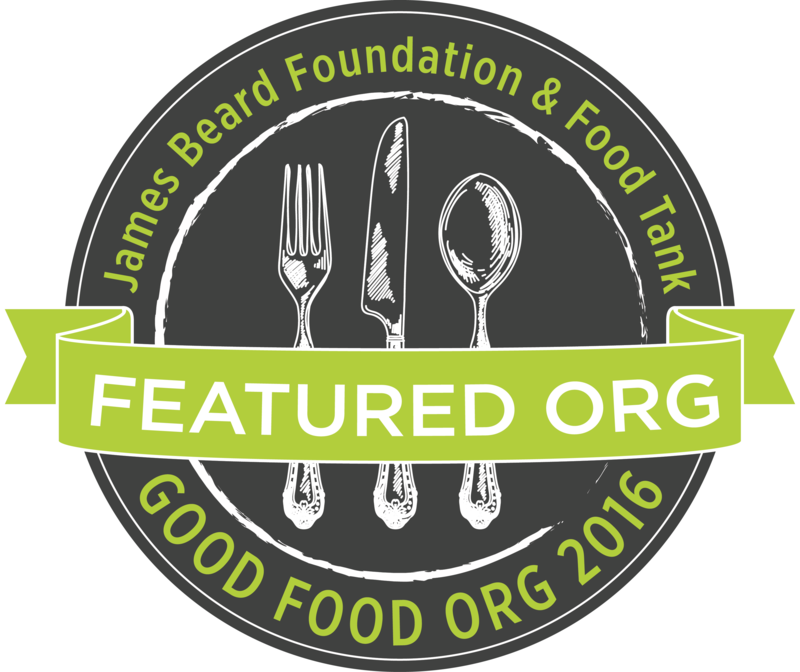 Voting continues through Aug. 31 so we need your votes to close the gap. And don’t forget, the Alaska Grown Eat Local Challenge takes place on Aug. 22-28 and our next market is on the last day of this special week that promotes eating locally grown and harvested foods. Stop by the Sitka Farmers Market on Aug. 28 to buy what you need to make a local meal. 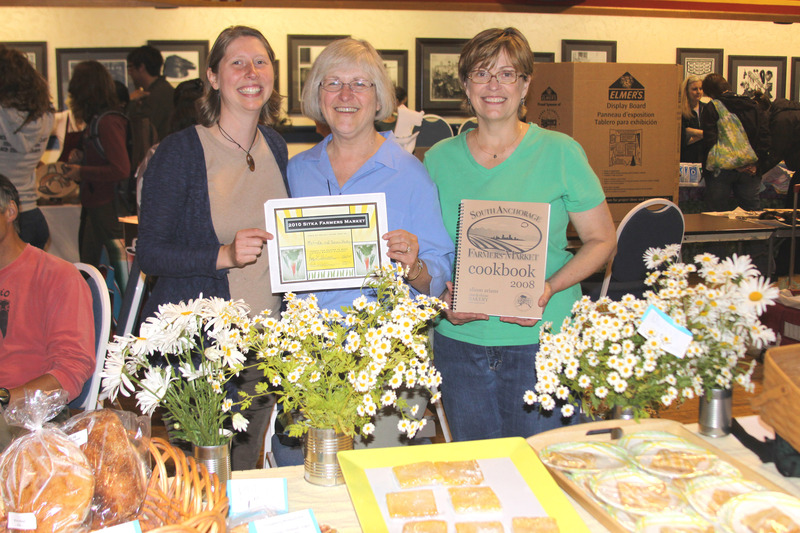 Sitka Local Foods Network boardmember Johanna Willingham, left, presents Karen Christner, center, and Malinda Bonsen, right, of Malinda and Karen's Bakery with the Table of the Day award at the second Sitka Farmers Market of the summer on July 31 at Alaska Native Brotherhood Hall in Sitka. Karen Christner and Malinda Bonsen of Malinda and Karen’s Bakery won the Table of the Day award at the second Sitka Farmers Market of the summer on July 31 at Alaska Native Brotherhood Hall. 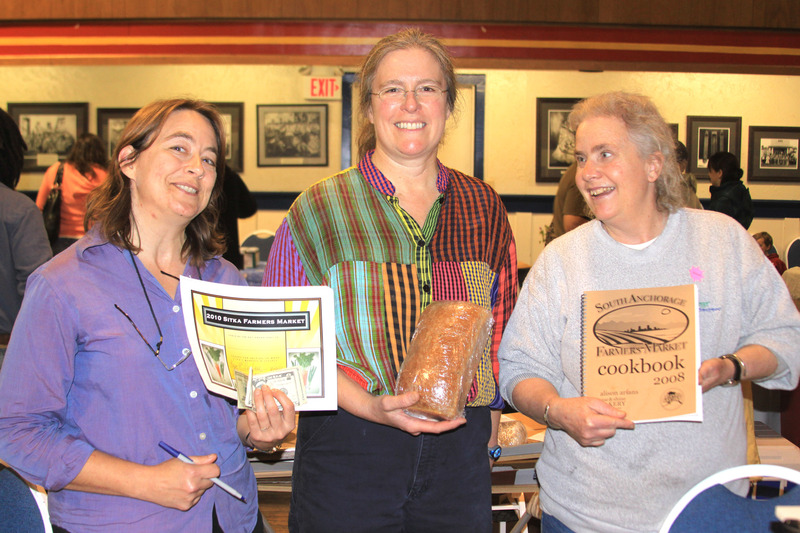 The two local home bakers were presented with a certificate, $25 cash and a farmers market cookbook by Sitka Local Foods Network boardmember Johanna Willingham. Karen and Malinda baked bread, cinnamon rolls and other desserts to sell at the July 31 market. They also sold some flowers and vegetables from their home gardens. One vendor at each of the five scheduled Sitka Farmers Markets this season will receive a similar prize. The next markets are from 10 a.m. to 2 p.m. on alternate Saturdays, Aug. 14, Aug. 28 and Sept. 11, at historic ANB Hall. We look forward to seeing you at our next market. A slideshow of photos from the second Sitka Farmers Market is posted below, and a similar slideshow can be found on our Shutterfly site. 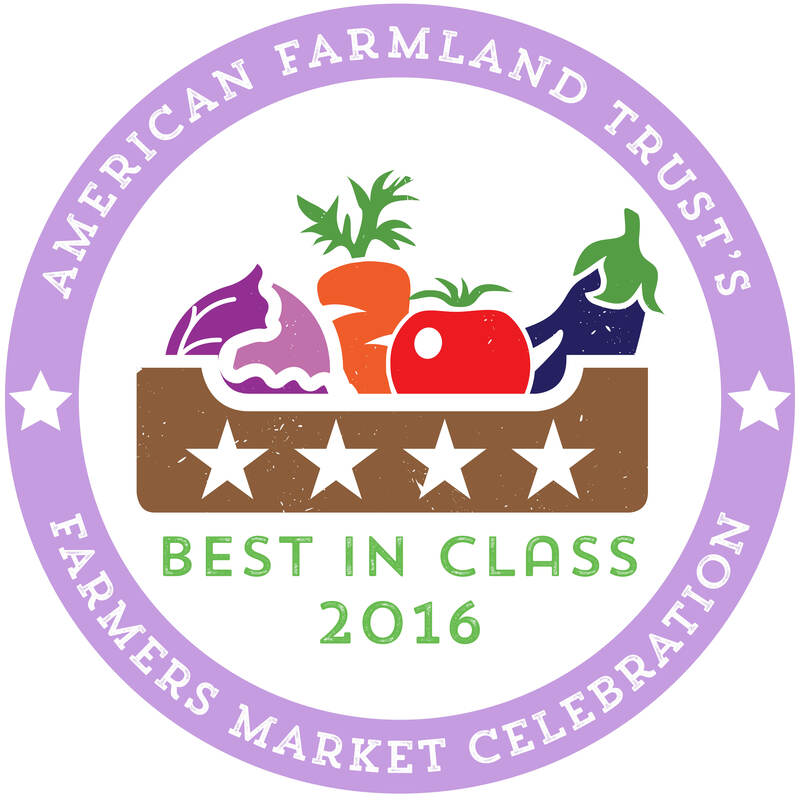 By the way, if you haven’t already done so, please go to the America’s Favorite Farmers Markets contest site run by the American Farmland Trust and vote for the Sitka Farmers Market. Voting is broken down into four categories based on the number of vendors at each farmers market. The four categories are Boutique (15 or fewer vendors), Small (16-30 vendors), Medium (31-55 vendors) and Large (more than 56 vendors). The Sitka Farmers Market competes in the Boutique category, and we need about two dozen votes to climb into the national top-20 ranking for our category. Even though the Sitka Farmers Market is in the smallest size category, it was the leading vote-getter for Alaska as of Thursday, July 29. But a flurry of voting that night vaulted HomeGrown Market of Fairbanks (a Medium market) well ahead of us in the battle for the top market in the state. 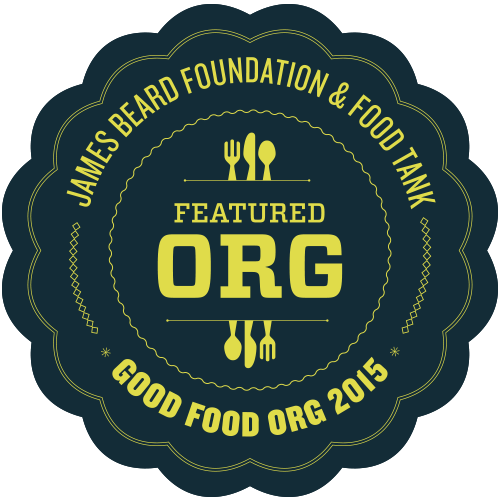 Voting continues through the end of August so we need your votes to close the gap. Lori Adams of Down To Earth U-Pick Garden received the Table of the Day Award from the first Sitka Farmers Market of the 2010 summer season July 17 at Alaska Native Brotherhood Hall. Adams, who has had booths in the Sitka Farmers Market for three years, grows vegetables, flowers, berries and herbs at her garden, located at 2103 Sawmill Creek Road. 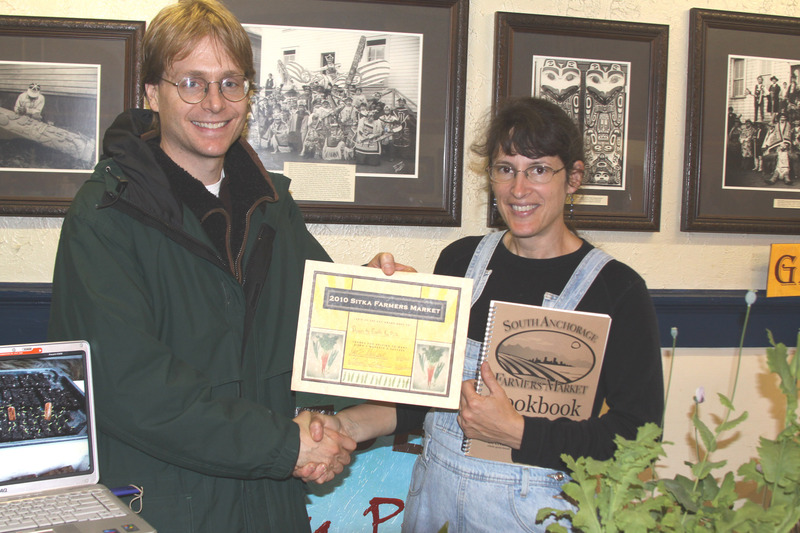 Sitka Local Foods Network Board Member Doug Osborne presented Adams with a certificate, $25 cash and a copy of the South Anchorage Farmers Market Cookbook. One vendor at each of the five scheduled Sitka Farmers Markets this season will receive a similar prize. The next markets are from 10 a.m. to 2 p.m. on alternate Saturdays, July 31, Aug. 14, Aug. 28 and Sept. 11, at historic ANB Hall. 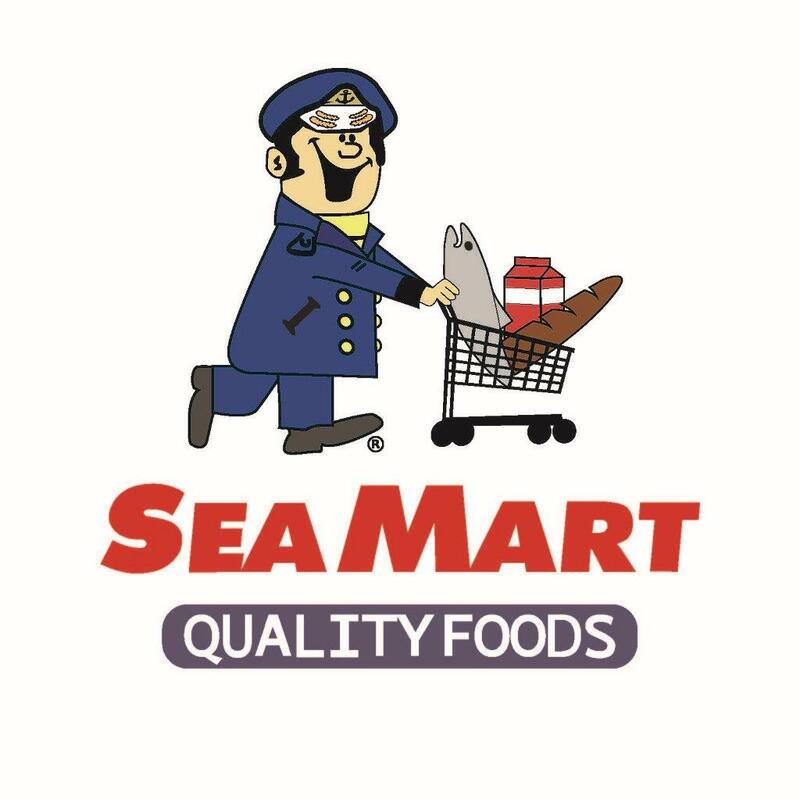 The first market of the season received lots of publicity, including a KCAW-Raven Radio morning show interview (link has audio) with Sitka Local Foods Network President Kerry MacLane on Friday, July 16, to preview the first market, and an audio postcard on KCAW’s Monday, July 19, newscasts. The Daily Sitka Sentinel also ran a Weekend feature on Friday, July 16, and had a front-page photo from the market on Tuesday, July 20 (password required to view content). A slideshow of photos from the first market is posted below, and a similar slideshow can be found on our Shutterfly site. By the way, if you haven’t already done so, please go to the America’s Favorite Farmers Markets contest site run by the American Farmland Trust and vote for the Sitka Farmers Market. 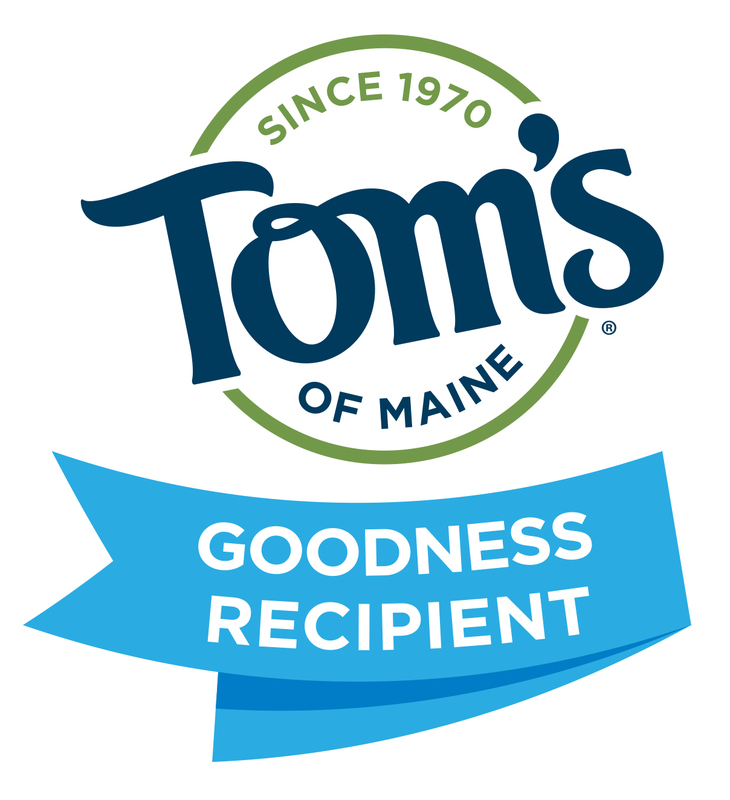 The Sitka Farmers Market was the leading vote-getter for Alaska as of Thursday, July 22, but voting continues through the end of August so we need your votes.